Batteries said to be destined for Apple's next-generation. 4.7-inch "iPhone 6" appeared on the internet Thursday, seemingly lending credence to recent whispers that the company would bump the handset's battery capacity to 1,800 mAh from the iPhone 5s's 1,500 mAh unit. 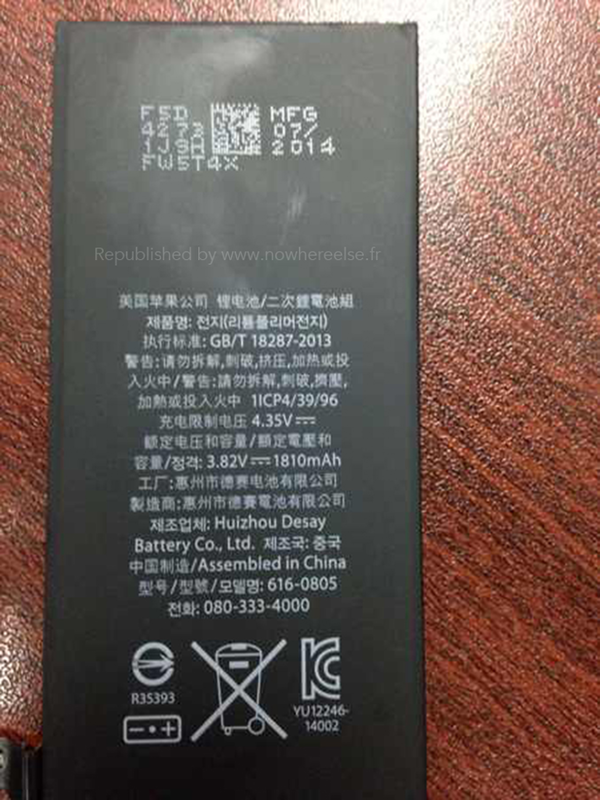 The pictured parts bear a capacity rating of 1,810 mAh and appear to be manufactured by Desay Battery, a supplier previously rumored to have been certified by Apple for the iPhone 6. French blog nowhereelse.fr was first to publish the snapshots, which appear to come from sources in China. Not clear from the photos is the batteries' physical dimensions, which is said to have caused a great deal of pain for Apple in the run-up to manufacturing. The company is thought to have had trouble when attempting to slim the parts down by some 30 percent, a reduction reportedly required for the design of Apple's next-generation handsets. At least one report from earlier this week suggested that Apple may have solved that dilemma, though the company said to have come through with the solution is Taiwan-based Simplo Technology. If legitimate, the 1,810 mAh battery in the iPhone 6 would give the handset one of the smallest power reserves in its class. Motorola's own 4.7-inch Moto X, in comparison, packs a 2,200 mAh battery.